The following morning, we were still in the Land of the Giants, Redwoods national and State Parks. We enjoyed the short hikes we did. Looking so small among the big tress is so awesome, feeling like Jack in the beanstalk, trees seems like reaching the sky. Join us again as we go around the Land of the Giants. Redwood National And State Parks is a United States National Park and a UNESCO World Heritage Site that is located on the North Coast of the state of California. The park protects several groves of massive redwood trees, which can live for 2000 years, grow to heights of up to 367 feet, and be as wide as 22 feet at the base of the trunk. Created by Congress to protect lands adjacent to three California state parks (Jedediah Smith Redwoods State Park, Del Norte Coast Redwoods State Park, and Prairie Creek Redwoods State Park) in 1968 with the creation of Redwood National Park. In 1994, the California Department of Parks and Recreation and the National Park Service agreed to jointly manage the four-park area for maximum resource protection. The road to Fern Canyon is unpaved. And we crossed a very shallow 3-5 inches stream of water. Some didn’t want to cross it, thinking it was so deep for their cars cross and opted to park and just hike for maybe about 4 miles. Reaching the dead end of the road is the parking lot. Then hike half mile from packing lot to the entrance of the canyon. Imagine walking through a narrow canyon where the walls are completely covered by luxuriant ferns and mosses and are dripping with moisture. 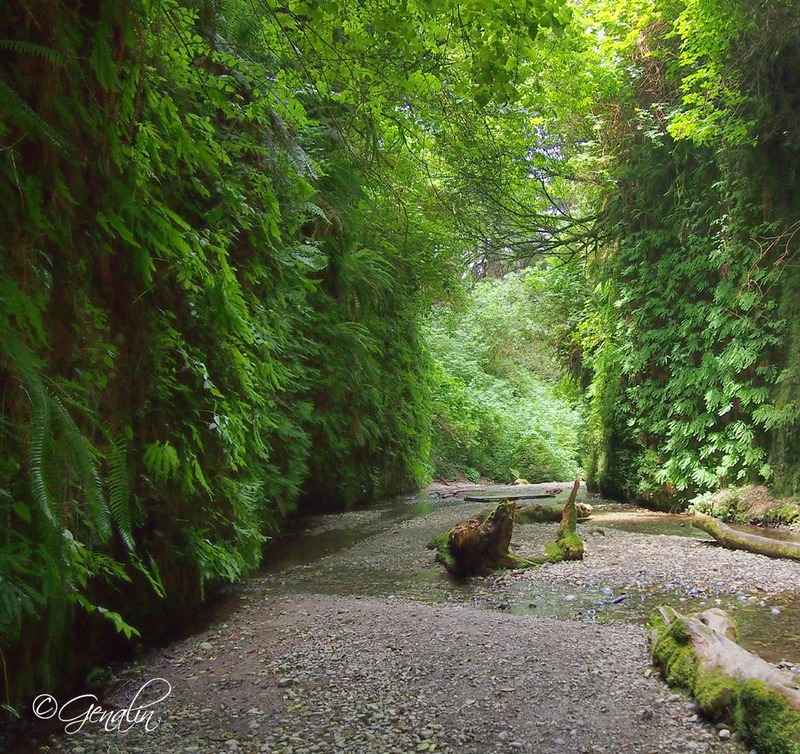 That describes Fern Canyon, an unforgettable natural wonder that Steven Spielberg chose as a location for Jurassic Park 2: The Lost World. This level trail of about one mile follows Home Creek as it courses through the forest. The vertical walls sprout an amazing variety of ferns and other moisture-loving plants and mosses. Depending on the time of year, there is a constant drip-drip of water trickling down the canyon walls. One can hike into the canyon and back, or continue on to a trail/stairway that climbs out of the canyon. At the top, turn left to return along the canyon rim, with fine views into the canyon and other interesting sights. Such an awesome experience hiking the Fern Canyon, while you hear the water dripping from the canyon walls, the water gushing with the canyon walls and the birds singing their own tunes. From Fern Canyon, we continue to head south. Passed by Trinidad, California for a snack, and to visit Trinidad Memorial Lighthouse. Many people love to see the historical lighthouses along the coast of Northern California. The Trinidad Memorial Lighthouse is a shining example of these. This lighthouse is a replica of the original Trinidad Head Lighthouse still in use today. Both the original 1898 big fog bell and Fresnel original fourth-order lens stand on the site of the current park. They make a perfect addition to the little park overlooking the rocky coast below the town of Trinidad. The lighthouse memorial now stands as an everlasting monument to those lost at sea. After the memorial was established, the list of names of all the people lost at sea soon outgrew the small plaques. More plaques have been affixed to the retaining walls. The “real” Trinidad head Lighthouse is a very small tower which sits high up on a headland along California’s north coast. Built in 1871, it is still in operation today, but is off-limits to the public. From Trinidad we headed to Eureka, checked in then stroll around the area to look for the Carson Mansion and look for a place to eat. Just 2 blocks away from the hotel we checked-in is the Carson Mansion. 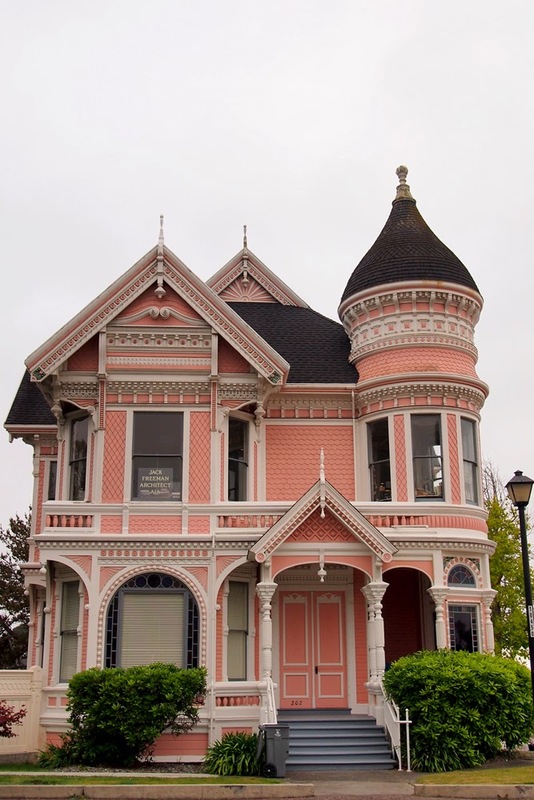 The Carson Mansion is a large Victorian house located in Old Town, Eureka, California. Regarded as one of the highest executions of American Queen Anne Style architecture, the home is “considered the most grand Victorian home in America.” It is one of the most written about and photographed Victorian houses in California, and perhaps, in the United States. Originally the home of one of Northern California’s first major lumber barons William Carson, since 1950 it has been a private club, The home and grounds are not open to the public. To the west of the Mansion sits another grand Queen Anne. The home was built in 1889 by William and Sarah as a wedding present to their son John Milton Carson. This house was also designed by the Newsom Brothers. The Queen Anne façade is dominated by a large domed turret, so characteristic of the style. Layering, spindle work, and surface undulation also help to define this home as Queen Anne. 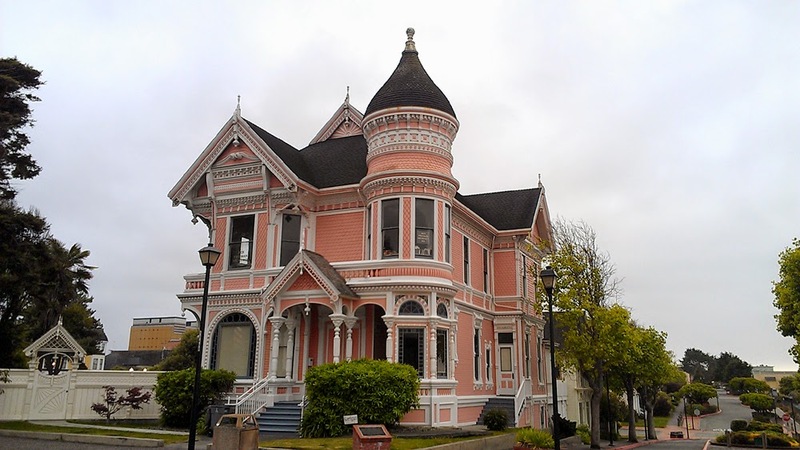 The pink and white color of the home has endeared itself to locals as the “Pink Lady.” The clustering of these two landmark Victorians at the foot of Second and M Streets, certainly helps to define the boundaries of Eureka’s Old Town which is listed on the National Register of Historic Places.